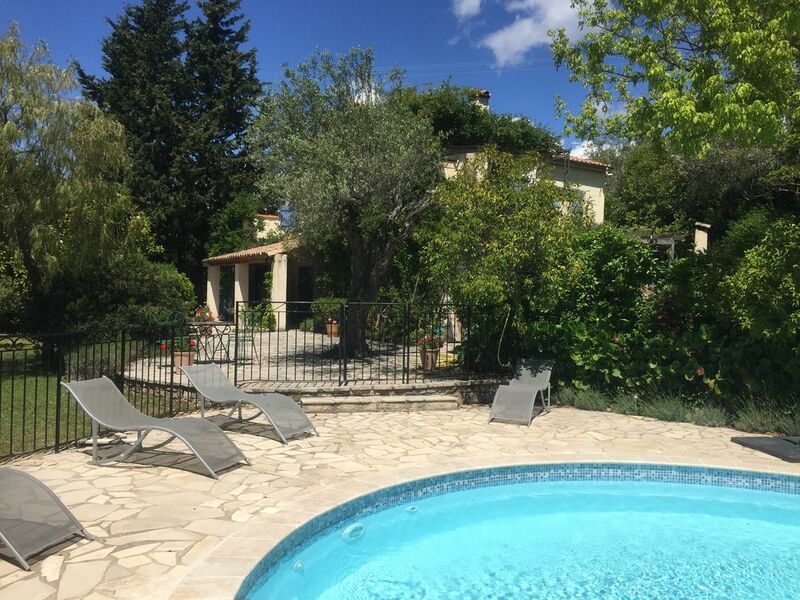 L'Arc En Ciel is a beautiful detached Provencal villa within the stunning medieval village of Fayence yet only a few minutes walk from the centre of town. It has mature gardens, a large swimming pool and sun terrace with magnificent views towards the Esterel Mountains.There is an outdoor eating area to the side of the property with a summer kitchen complete with built in barbecue and rotisserie and a wood fired pizza oven.The house is set back from the road in a complex of three Provencal style properties. There is parking for 3/4 cars. There is a large covered terrace to the front of the property and a private upper terrace accessed from the main bedroom. Spacious living accommodation comprises a fully equipped large kitchen with seating for 8, dining room with seating for 8 and direct access to the terrace, sitting room, separate large studio room, 4 bedrooms, 3 bath/shower rooms. Air conditioning in most rooms. A TV with Freeview in the sitting room and wireless internet. The master bedroom ensuite has 2 separate washbasins, bath with shower, wc and heated towel rail. Family bathroom has 2 separate washbasins, shower enclosure, WC and heated towel rail. Downstairs shower room has a shower with enclosure, washbasin and WC. In addition to the living room there is a large split level studio room which either can be used as a summer living room or offers separate accommodation with its own acces.It has a dining table with for stools, sofa and easy chairs, sink with work surface, microwave and programmable air conditioning and hot air unit. There is a clothes drying area The property is suitable for older children. In the kitchen there is also a kettle. We were impressed by the description of this lovely house and it lived up to our expectations. Great for two families sharing, as we were, the kids particularly loved the pool and we all loved the space, established gardens, pizza oven, comfy bedrooms, well equipped kitchen, games, location..... everything really. It is very much a home from home. The information pack was great, communications great, helpful tips provided. We would recommend this house. Locally we enjoyed time at the lake, visiting the coast only a couple of times, and loved being able to stroll down to the village centre to the market and restaurants, then stroll at a much slower pace back up the hill! We hope to be back. We are so pleased that you all enjoyed your time at our family home in Fayence. We look forward to you visiting again! The Villa was as described - spacious and very well equipped. The separate sitting room/bedroom arrangement was ideal for son and daughter in law so they could escape the children. We all loved the pool and the table tennis table, plenty of games and DVDs. Really, it feels like a family home. The position above the town and the steep hill meant that we oldies took the car but younger members of the family could walk back from dinner. The outside dining/kitchen was used most nights and we had a local chef in to cook one night. We are so pleased that you all enjoyed our villa and that if felt just like home. That is exactly what we are trying to achieve. We have taken on board your comments about the shower thermostats and will have then changed in the winter time. This was our third visit to this villa. A great base for exploring the wonderful countryside and ancient towns in Provence and not too far for a days trip to the coast. The villa is situated on the hill providing lovely views and within a short walk to the centre of Fayence so you are not dependant on a car after an evening out. We enjoyed the coffee, croissants and shopping at the market - very French! Several good restaurants but our favourite is Les Temps des Cerises. A good excursion is a walk to the pretty village of Seillans - then you have earned your lunch at the excellent La Gloire de Mon Pere. The villa is very comfortable, quiet with pretty pool and gardens. Perfect as a base to explore or just to chill out and enjoy the weather, food and wine! Thank you for your kind words. We are pleased the house met your expectations. Hope to see you again. We (family of five, with three teenage daughters) have now stated at L'Arc for the last three years - which says something. The house is in a perfect location (though one does need to be able to negotiate the walk back up the hill sometimes), with wonderful views, the sound of birds, the gentle ringing of the bells in the distance and the "swish" of the occasional glider passing overhead. Two of us summoned up the courage this year to do a vol d'initiation in a glider and it was breathtaking! The house is nicely laid out, with plenty of room either for everyone to be together or to retreat to different rooms: the studio room is very cool and a good place to escape the heat. The pool is very nice and great for that necessary dip to cool down, especially after a walk down to the town. The upper terrace, with the main bedroom, is superb and is a wonderful place to just sit and read - enough, but not too much, sun. Fayence itself is charming. We love the market (three days a week) and frequent the same stalls each year (especially the roast chicken and fried potatoes!). The bread is heavenly, in particular La Fayencoise. As for the restaurants, there are many of all sorts to chose from. We really liked Le France, Pattin Couffin and L'Entracte, but have also been to many of the others. As for excursions out: Fondation Maeght, Lac de St Cassien and Gorges de Verdon are frequent attractions, but try also Abbaye de Thoronet. The coast is there should you so desire, but the hills are much nicer! Wow a great review not only of the house but also the area! Seems they like it as much as we do. We had 14 fantastic days at this lovely place. The house has plenty of space and the garden is lovely with several nice sitting areas. We used the outdoor barbeque area a lot and we had all our breakfasts outside next to the nice smelling lavender and view to the pool and the garden. Our two kids ( 5 and 8 yrs.) also loved it here. It is only a short walk to the very cosy town Fayence. We are very pleased with the good follow-up from the house owners. We would love to come back to the house and area. We look forward to our third visit to L'Arc en Ciel this summer, accompanied again by three university-age daughters and their friends. The spacious and elegant property, which is generously appointed, offers plenty of privacy and comfort; the pretty garden and pool area too are well designed so that even with a full house, there are private places for reading and relaxing. The nearby town has all basic provisions and jolly music and dancing in the square a couple of evenings each week. It has some good restaurants too - the short but steep walk home afterwards affords just enough exercise to counter gastronomic indulgence! It is delightful too to eat 'at home', experimenting perhaps with the pizza oven and choosing,depending on the time of day, the table beneath the pergola or that in the welcome shade of the porch, which easily seats ten. While there are of course plenty of delightful places for outings - the Lac de St Cassien or Nice - it is tempting simply to remain at the property, enjoying the pool, the boules, the table tennis and the view. Fayence is the largest of one of 5 medieval towns, all are extremely attractive with their own squares, bars and restaurants. The market in Fayence is on Tuesdays, Thursdays and Saturdays with larger markets at Antibes on Saturdays and Le Muy on Sundays. The location offers a unique diversity of beaches and nightlige on the coast together with the superb attractions of Provence including the Gorges Du Verdon which is approximately 45 minutes away, Le Lac de Cassien is about 15 km away and offers watersports, windsurfing, rowing, pedaloing, swimming and fishing. The town of Grasse famous for its perfume industry is 20 mins from the Villa. The A8 (junction 39) is close by and gives access to Frejus, St Raphael and St. Tropez to the West, Cannes, Nice and Monte Carlo to the East. There are 2 golf courses nearby at Terre Blance and within a 15 km drive is St Endreol at La Motte and within a 20 min Chateua Tourlane.